Effectively heats 1,600 to 2,400 sq. ft. When connecting appliances to stovepipe things don't always match up as well as you'd like. With this Dura-Black Steel Double-Skirted Stovepipe to Appliance Adaptor you can connect Dura-Black Stovepipe to flue collars that are slightly smaller than your pipe's opening. A decorative collar provides a finished look where the chimney pipes meet or pass through a wall. This collar by DuraTech is appropriate for use with the 6" DuraTech chimney pipe system and comes with a sleek black finish that will complement any decor. The DuraTech chimney pipe collar will connect to DVL and Dura-Black Stovepipe adaptors as well, and its use is required in installations that use a wall thimble. Protect your home by making sure that any chimney installation follows the manufacturer's instructions as well as all applicable safety codes. There are three things you look for in a wood-burning stove: efficiency, ease of use, and an outstanding appearance. A truly perfect hearth accessory, this US Stove Country Hearth EPA-Certified Wood Burning Stove with Blower possesses all of those qualities and then some. Any room of your home would benefit from the addition of this amazing stove. And so would your wallet. Capable of generating more than 112,000 BTUs and heating up to 2,400 sq. ft., this steel wood-burning stove is an excellent secondary heat source. That means that rather than having to continually raise the heat - and consequently your heating bill - to warm that drafty den or guest room, you can just use an Country Hearth Wood Burning Stove to keep those problems spots nice and cozy. No matter whether you're talking short term or long term, you'll save when you invest in this budget-friendly home accessory. 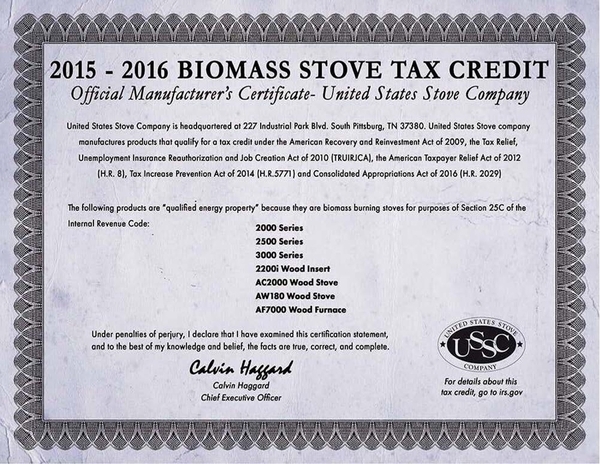 So really, when it comes to hearth appliances, you can't do much better than a US Stove Country Hearth EPA-Certified Wood Burning Stove with Blower. It will effectively keep your family and friends warm, reduce your heating costs, and, of course, provide your home with the kind of traditional charm only a classic wood stove can offer. 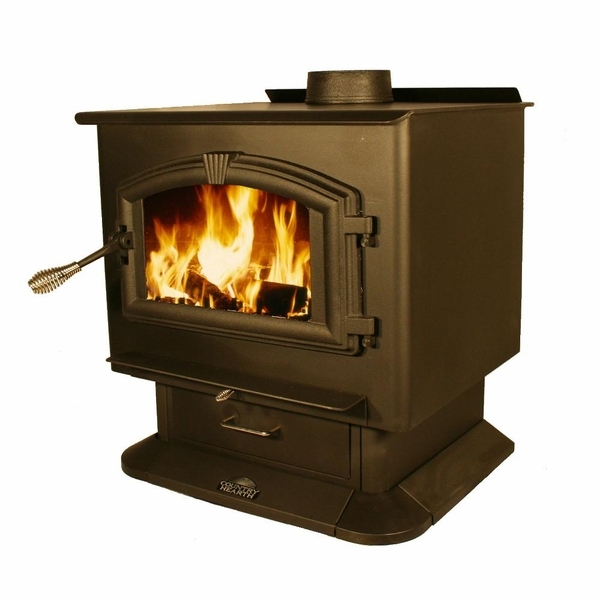 Yes, this stove is tested and listed to proper UL-1482 standards for a wood stove. What size logs does this accept? This stove can accept logs up to 21" in length. Can I burn bio bricks or wood blocks in this US Stove Country Hearth EPA-certified wood burning stove with blower? The manufacturers of EPA stoves do not recommend burning such items, as the paraffin binding agents can build up quickly on the secondary air tubes and manifolds, causing poor operation and smoking when the door of the stove is opening. Only untreated softwood kindling and hardwood logs should be burned. What is the average burn time of this wood burning stove? This unit has a maximum burn time of 6 hours on average, although well seasoned wood and good fire tending skills can push burn times to 8 hours. How would I get the ashes into the ash drawer? Does this stove have one or two blowers? There is an ash plug in the center of the firebox floor that allows you to sweep ashes into the drawer. The unit has a single large circulating blower motor. What should I use to clean the glass? We suggest cleaning your stove glass using a specialized cleaning product such as the one found here. Make sure to only clean the glass after it has completely cooled do avoid damage to the glass. What is the size of this unit? Does it have a thermostat controlled blower? What are the clearances needed for this stove? This stove measures 30.75" high x 27" wide x 25" deep. Clearances are 20" to side walls, 12" to rear walls, and the unit must be installed in a room with 7 foot ceilings or greater. A variable speed, automatic blower is included. What is the fire box rating for this? This unit is listed by Omni Test Laboratories to current UL 1482 standards. The unit is rated to handle 21 inch logs and can operate with HT type chimney with a rating of 2,100 degrees. Can the top be used to cook food? It can. However, it is recommended to use a cast iron griddle to protect the surface of the stove, as stainless or copper cookware can mar the finish. Do I need a wood grate inside also? EPA stoves are designed to be operated without using a grate. A small fire using kindling and paper is to be built directly upon the bottom firebrick. Once the kindling fire has ignited, medium sized logs can then be added. The unit injects air from the upper air tubes down upon the fire logs. The top down burn method renders a grate unnecessary. Is this model approved for manufactured homes? This item is approved for use in mobile homes, as long as the fresh air kit is installed with it. Is the foam inside the top of the stove is supposed to be left inside of it? There should be a refractory baffle that sits atop the air tubes within the unit. These are the 3 round tubes that are in the ceiling of the firebox and run from side to side. In some versions of this unit, they will also include a refractory insulation blanket that can be seen by looking down through the flue opening. This should also be left in place. Any lightweight packing foam should be removed. What is the height of the combustion chamber? Per the manufacturer, the combustion chamber for this stove is approximately 10 inches in height. What is the warranty for this stove? Per the manufacturer, this product has a 3 year warranty on all stove components. How close can the stove be to walls with windows in them? The manufacturer advises that the stove must be at least four feet from a tempered glass window. This will prevent the glass from cracking from prolonged heat exposure. Can this stove be installed without the pedestal and ash pan? Unfortunately, no, this stove is only available complete with the pedestal and ash pan kit. What is the depth from the front of the pedestal to the center of the flue on this? Per the manufacturer, the distance from the front of the pedestal to the center of the flue collar is 17". How is the fire/heat controlled in this stove? This stove features a primary air control handle that is located between the stove door and the ash pan. Seems to be efficient. Damper is iffy. Seems loose but shuts down ok. Like the ash pan. ConsAs stated, damper seems loosely fitted, but does its job ok. Arrived in good condition. All my concerns about delivery where addressed by my reps. Stove heats well. Overall a great experience! I love this stove and the price was amazing for the quality I received.It is doing a great job, and I only have to load it once at night to completely heat my 2,500 sq/ft home. There was some confusion on the EPA numbers and BTU output not matching the advertised values. Our house is a Cape Cod style, about 2500 square feet. This stove works pretty well for us, but I kind of wish now Id have paid more and gotten a larger, more efficient model. Things I like about it: The heat just pours out of it! So, no complaints on that score. I really like the air wash feature on the glassworks great. The stove burns for about six hours at a shot, which seems reasonable to me. Things Im not so happy about: This model requires more space in front of it (26 inches) than do most other models (18 inches). So be aware of that as you decide where youre going to install it. You wont pass code inspection if you dont do it right. So thats for in front of the stove; behind the stove, they say you can have it about 11 inches from the wall. I did that, but, boy, does that wall get hot! I cant even lay a hand on it when the stove is cranked up. So you may want to allow more than 11 inches of clearance behind the unit. Hardware on the door (hinges and latch) doesnt seem to be the greatest quality. Inside the stove at the top is a fire board. Be careful, its fragile and can be cracked easily! (Yes, this happened to ours.) Things I would change about it if I could: I wish the damper rod worked left/right rather than in a pull fashion. I wish I could vary the fans speed more easily. I wish the blower wasnt so loud. Aside from having a firebox that seems a little on the small side, it is able to do quite well in keeping my home nice and warm. Changed with the Times and I'm Glad I Did! Using It for a Second Year, Good Stove! One big reason to get a wood burning stove is because of the money it can save you, and that's sure true in my case! I used to sped a lot of money on propane every winter. Now I can keep my over-2800-square-foot home heated all winter to about 70 degrees even when the temp's around zero. This is my second winter to use the stove. I like the big firebox and the fact that it has dual blowers. I also got good customer service when I had a problem--one of the blowers caused a really annoying vibration, like it was out of balance or something. I called the company and they sent me a new blower, free! Can't beat that. Wish the damper settings allowed more variation, but I found another way to allow more airflow in--I just open the spin draft a little bit. I think the stove is well worth the price! This does a terrific job in keeping a large room, and the ash tray is quite nice. This stove is everything I was looking for in a stove. I give it a top rating for being energy efficient, great price, shipped really fast, and the installation was easy. The only drawback was that it was delivered on a truck with no lift and we didn't have anyone here that could assist the driver. This sturdy stove was easy to assemble, looks attractive, and is easily heating my LARGE house. I'm not really complaining, but it would have been nice if the grate was included,instead of having topurchase itseparately. I give this stove my highest rating. Its ability to adequately heat a 2,000 square foot home will make this stove a great choice if you are looking for anew, primaryheat source. It's a quality, great looking stove that heats very efficiently. Best wood stove I've ever had and I've had several. Heats 1700 sq ft with no problem. Heats 5-6 hr with small load of hemlock. Keeps glass clean too. I am enjoying the fact that since running this stove the electric furnace has never come on. It is keeping our home nice and warm on the lowest setting. Hot coals are always present,making it easy to keep fired up. What a great stove! All around, this heater has proven itself to be an excellent purchase. It has cut down significantly on my heating expenses, and also has managed to keep my home much warmer as well. The first time I used it, there was a lot of smoke, but since then, the smokiness issue has abated significantly. I purchased this stove in October 2011. I installed the stove on November 9th , I followed the pipe heating instructions per manual, then lit the stove. This is the best wood stove I have ever owned. My house is 1955 sq. ft. it heats the whole house evenly. I would truly recommend this stove to anyone. whether it be for back up heating system or for everyday use. This is my only source of heat , and I am very satisfied with this purchase. The purchase all the way to the function of this stove.It is a beautiful stove for the price. Last year I used this stove as a second source of heat. Heating my 2,000 sq/ft home was not difficult at all. If you have existing ductwork, it's very easy to install andto get heat throughout the house. I wish the blower was not so loud and that the damper worked better. I may try and make some improvements this year. Overall, this product has been a tremendous asset to our home in that it is everything that we needed for it to be. I intended for it to be a standalone heating system to keep our home warm and it has managed to do just that and more. The installation instructions were very user friendly. One suggestion I would like to make is that you burn it outside prior to installing it; this will get rid of oils that will leave a very nasty smell. I am thrilled with the purchase of this stove. We got it for a great price, andI simply LOVE it! I love how it heats, and I love how it saves me money on fuel costs. We put this stove in the basement of our 2 story home, and with the use of the blowerit heats wonderfully. I just couldn't be happier. I have no complaints for this stove. It heats my large house to a very warm temperature. It is so much more economical than electric or gas heat. There are other items that may need to be purchased for the installation. I spent an additional several hundred dollars on pipe and duct work for my particular situation. After watching my power bill go from under $200 each month to over $600, I decided it was time to look into getting a wood stove. I've put it in my home's basement and have attached it to my house's ductwork on the first and second floors. I just did this yesterday, but so far it seems to be doing a great job. It's been around thirty outside and my house's square footage is about 3000. Now, when you first start it up, it does smoke some. And the fan makes the side panels vibrate, which could be annoying. But it's in my basement, so that doesn't bother me, and when I think of how much money I'm saving each month by using this stove, I'm not complaining! My only complaint about this stove is that it is not manufactured here in the USA, but rather imported. The stove itself is a great product and I can highly recommend it. It is a quality stove that gives off a lot of heat. Let me begin my review by saying that I have been using wood stoves for over forty years, and the results I have received from this product would place this right at the top. There have been a few minor problems along the way, but overall, it has managed to exceed my expectations. When it was delivered, it arrived on a wooden pallet. The minor quibbles that I have with this product include an ash tray that is a little on the shallow side and a blower that has some bad vibrations. Just to tell you how effective this stove is, the outside temperature could be a frigid fourteen degrees while this stove is keeping the indoor temperature at a very comfortable 73 degrees. I like this stove pretty much, but it's kind of a mixture of good and bad. I bought it to replace an old stove I'd had for 20 years. I liked that stove a lot. There are some things the old stove had that this one doesn't, and I miss those features. Such as, the old stove's door was larger and used to swing down (this one swings out), so I have to split the wood now--more work for me. The ashes tend to spill out when you open it, but if burning wood gets up against the door, you can't open it. Things I like better about this stove: I like being able to see inside through the glass door. The blower is much quieter on this stove than it was on my old one. And this one puts out more heat than the old one did. This is an amazing stove that has cut down on the amount of wood I need to burn to keep my 3,000 square foot home warm during the summer time. The one minor issue that I have had with it is with the blowers. They have been a little on the noisy side, and I wish that there was a different way to mount them. Aside from the ash pan being on the shallow side, this is a very well designed and constructed stove. It has very competitive pricing, and the instructions make the installation process quite easy. This is an all around terrific stove that is equipped with just about every conceivable item that an individual would need to have. I love it so much I use it all of the time. I was very happy when my stove arrived well packed andseveral days early! Thank you for the fast delivery. I was able to do the installation myself. It was a little frustrating that in my case, the wire was too short. I was able to make the adjustment, but it might have proved difficult for others. The stove is up and running now and has my house very warm. I would certainly recommend this stove to everyone. Our house is between 1500 and 2000 square feet, and this stove does a nice job of keeping us warm. It's nice to have the blower, but we rarely use it. Well made, economically priced. The company also offers a thermometer for the stovepipe, and we're thinking of getting one of those too. We've very happy with this product and recommend it! We live in a farmhouse that's over 100 years old, and it has the problems typical of an old home like this--not very energy efficient, leaky windows and doors, poor insulation. It gets really cold, windy, and snowy here in the winters too. But we've been really pleased with the way this stove heats our home (which is nearly 2000 sq ft) upstairs and downstairs. And we haven't even had to use the blower yet. Only negative I can think of: the glass on the front door turned yellow, but that's really no big deal considering the way this unit pumps out the heat. Nice looking stove. We're really happy with it and are glad we bought it! We did our research first and thought this would be the best stove for our needs. I recommend you do the same, because we ended up very happy with our purchase. It was easy to order, it came quickly and in good condition, and we thought installing it was pretty easy. Here's another tip--find the manual online before the stove arrives and read it so you'll be ready to go when it comes. This model states you have to have two feet of clearance on the front side, almost 11 inches on the sides, so plan appropriately for that. On some models you have to pay extra for the ash drawer and blower, but those come standard on this model at no extra cost. (Nice!) Sometimes people complain about the blowers being too loud, but we've found this one isn't loud at all unless you set it on high. We clean the glass on the door with steel wool, no big deal. One thing I would change if I could--the company sends two hoses with the fresh intake kit. One hose isn't long enough by itself, so you have to hook them together. I wish they'd just send one hose that was long enough. Wouldn't that be simpler for everyone? Anyway, we're very happy with the stove and do recommend it to others! It's not hard to use this stove, and it's not hard to clean it. I recommend getting the accessories with it--I purchased the blower/thermostat, air filter, and spring-loaded back draft, and they all work great too. I wish it didn't burn quite so much wood, but it's still a great stove. I've had it almost four years and am using it as the main heat source for our whole house.